Thank you for a wonderful concert at l’Olympia in Paris last Wednesday! Being a long-time fan I sometimes wonder how long the fire can keep on burning – your fire and mine. But this concert was reassuring. You have found a new attractive way to bring your music to us. A new format and new fellow musicians. To introduce a fiddler, Stuart Duncan, in the band proved to be ingenious. Well, he was new to me. Maybe he has played with you for a long time? Anyhow, what a fiddler he was! Sometimes enhancing the swing touch, sometimes enhancing melancholy and sometimes even creating a bit of Country feeling. Everything in line with a new sound that matched your songs perfectly. Keyboards, played by Patrick Warren, brought new atmosphere by introducing harmonica and other sounds. And you played a bit of electric piano! Everyone was excellent. Your old companion Anthony Wilson seemed to enjoy his new musical friends and was super. Your voice and expression was, as always, beautiful. The intimate part, where you brought us some of your old songs on your own, was exquisite. You took a chance, and were totally successful. But I am not surprised. Many of your songs are intimate in character. However, I was after the concert surprised that there were so few songs from your new album Wallflower. You could have played some more, but I did not miss them during the concert. But if you on the upcoming concerts will play, for instance, Paul McCartney’s If I Take You Home Tonight I believe it will be much appreciated. I have enjoyed your magnificent concert 2001, recorded on the DVD Live in Paris, many, many times – and I have always regretted that I could not be at that particular concert, at l’Olympia. 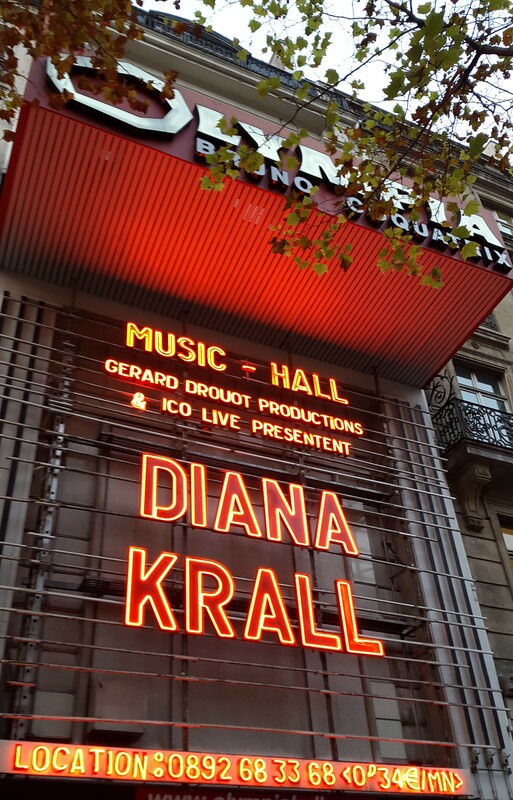 But now I have been to a “Diana Krall live in Paris” that was as good as the one I have on DVD. Pity this one was not recorded. But I am happy that I was there this time. Live at l’Olympia!